There are very few print businesses that can say they have ridden the tide of continuous change and market evolution and remained successful throughout their existence. Thomas Leach Colour is a company that has not only sailed through the industry challenges; it has excelled since its inception almost 120 years ago. Founded in 1901 as a print and stationery business primarily working in the Oxfordshire area the company has evolved to become the complete solution provider. Now offering design, sign-making, display and packaging work, PoS, mail & distribution fulfilment, digital & litho small and large format print, many of these services were beyond the company’s scope until it purchased a large format printer and a DYSS X7-1624C digital cutting table from AG/CAD. The Océ Arizona enabled the print specialist to process a greater range of substrates and increase its offering to customers. However, the operator of the Océ was also tasked with hand-cutting; a laborious task that had a number of limitations for Thomas Leach Colour. Firstly, the company could only cut straight-line profiles with any level of precision-shaped profiles still had to be subcontracted out. The precision and edge finish quality of hand cutting was often inconsistent and liable to operator error. Additionally, the company was unable to cut vinyl, acrylics, display units or car graphics. 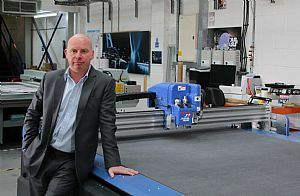 Without a digital cutting table, Thomas Leach Colour realised that hand cutting was a labour intensive process that limited precision and cut-quality whereas the alternative of external subcontract cutting had a cost and lead time consequence. Choosing a machine that would complement its large format printer, Thomas Leach Colour specified a DYSS X7-1624C with a 1.6m by 2.4m cutting table and a Superhead configuration with an oscillating knife tool, routing head and creasing wheel. This selection is complemented by the K-Cut Vision Pro system and the KASEMAKE CAD software. “As well as streamlining our business, we have reduced our costs considerably. The K-Cut Vision System delivers impeccable precision whilst the Superhead generates exemplary cut-quality. Both elements have eliminated waste and scrappage. There is no-longer an element of error that can be attributed to human error. This is particularly prominent on pop-up displays where the cut quality, precision and fit is a critical factor. Large format print has rapidly grown within our business and the DYSS X7 will enable us to rapidly evolve this side of our business. We are extremely pleased with the DYSS and the way it works in synergy with our large format printer is a delight for our business,” concludes Dave Mullord.